Don't ask when. Ask why. After a short while watching Hot Tub TIme Machine 2, a joke occurs that's almost certainly a callback to the first film. 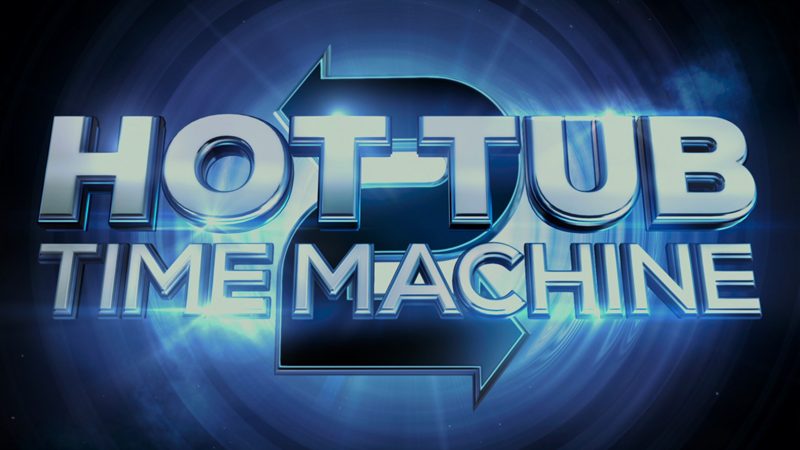 I say almost certainly, because five years later, I can't remember much of anything about the original Hot Tub Time Machine, except the cast, the general premise (there's a hot tub that's also a time machine) and that it was a silly, enjoyable comedy. Any specifics about the plot or any major comedy beats have been lost to the years that have passed between movies. So when this one keeps relying on knowledge of the first film to get references to things like "great white buffalo" and " Cincinnati", if you haven't watched the first film in a while, you can feel a bit left out. The film doesn't quite catch you up if you're jumping in fresh (a move that's not advised as it might sour you on the fun original) as we catch up with the three main characters Lou (Rob Corddry), his son Jacob (Clark Duke) and Lou's friend Nick (Craig Robinson), and see the effects of their adventures in HTTM. Their lives, which are marked by big, yet hollow successes influenced by their time travelling, are jarred by an attempt on Lou's life, which leads to another spin in the titular tub, and a trip to the future where they clash with a futuristic way of life and attempt to figure out who it was that tried to kill Lou (and just be generally awful people) before a late-game grab at meaning, reason and/or substance that the film definitely did not earn. Though Chevy Chase is back briefly, John Cusack didn't return for another dip in the time machine, and was replaced by Adam Scott (Parks & Recreation) in a related role. Considering how hilarious the actors playing the core four are, as well as how great supporting cast members like Gillian Jacobs, Jason Jones and Kumail Nanjiani are, this movie should be a slamdunk 90 minutes of funny, as all the main cast are hugely enjoyable. However, this film is such a disjointed pile of ideas that it's entirely conceivable that the entire shooting script consisted of the words "Hot Tub Time Machine" scrawled on a cocktail napkin, with the number two written hastily after it, perhaps in crayon, and it's actually possible that it was just the initials H.T.T.M., if we're being honest. That's the problem when you have an extremely funny cast and you rely far too much on improvisation. Inside a particular scene, that kind of energy is great. When the movie just seems to be floating through without any established motivation, that's a problem (and in the extras, it's noted that at least one scene was written simply to explain away a setting, so it's on the table that a firm story structure wasn't exactly the first priority.) The result is a movie where there are some very funny improvisational moments and a lot of padding between them. The big comedy moments obviously intended to draw the major laughs, which include gross-out genital issues, virtual gay copulation and a massive drug trip, tend to be the least engaging, with smaller moments coming off far better, like an odd exchange between Scott and Jacobs or the seemingly neverending games of "you look like," in which the guys describe things each other look like. When they are riffing, the fun is there, but too often it's lost in the chase of something shocking or memorable or in attempts to set up more false leads in the mystery of Lou's murder. If you need any proof that this film is lacking, the proof is in the trailer, which, you realize after finishing the movie, was mostly culled from the last 10 minutes of the film and has no real relation to the other 80. This Blu-ray includes an unrated version of the film, which pushes the runtime another six minutes longer, mainly on the backs of three scenes, including some additional female toplessness, a bit about beastiality and a somewhat alternate ending, which brings back another character from the first film and introduces more questions than answers. Why this one wasn't included in the theatrical is unclear and unfortunate. The film arrives on one Blu-ray and one DVD, packed in a standard-width, Blu-Ray keepcase. The Blu-ray features an static menu, with options to watch the film, select scenes, adjust the set-up and check out the extras (as well as the question, why is Adam Scott's character holding a harpoon gun, which from my increasingly dim recollection of the film, has nothing to do with the movie. Audio options include an English DTS-HD Master Audio 5.1 track, French, Spanish and Portuguese Dolby Digital Surround 5.1 tracks, as well as an English DVS 5.1 track, while subtitles are available in English, English SDH, French, Spanish and Portuguese. The 1080p, AVC-encoded transfer here captures the film's various looks quite well, thanks to a rich color palette and proper skintones, solid black levels and a very high level of fine detail which shows off the production value in the film (like Lou's ridiculous costume.) Even when the film plays with CG (due to the future tech in the film) things look good, with the detail showing in the pixels of the heads-up displays. Everything remains nice and sharp, and colors are appropriate, with no problems with digital distractions, despite the opportunity for issues during the film's manic drug trips, where the rapid action is handled smoothly. As with the visuals, there's a lot going on in the DTS-HD Master Audio 5.1 track, with strong music, an active soundfield that keeps the surrounds busy with atmospheric sound and well-placed effects, while the crisp, clean dialogue maintains solid separation from the rest of the audio. The low-end is powerful, supporting the film's chaotic flow and everything feels sharply defined, filling the room with the movie's energy. No complaints here. The big extra is a feature-length commentary by director Steve Pink and writer Josh Heald, which the pair joke their way through, while also pointing out easter eggs and goofs and share production details, even commenting on the film's "gay panic" comedy, before segueing into a commentary on Avengers: Age of Ultron. They get good grades for their energy, but they miss answering questions about moments that would be obvious to talk about (a point they raise themselves) and there are two large moments of dead air, which seem to have perhaps been the result of editing. They lose points for teasing an answer about the Cincinnati box and never delivering, despite the inclusion of some bonus "hidden" commentary. A somewhat brief making-of featurette (5:06) offers up interviews with Heald, producer Andrew Panay and most of the main cast, mixed with on-set footage. The story is discussed a bit and there's a look inside the structure of the actual hot tub, but there's not a lot besides the usual pre-release positivity. Besides featuring the first of two unnecessary exclamation points in the extras section, "The Future as Seen from the Tub!" has a five-part, 13:32 look at the future portions of the film, including discussion of the imaginary technology, the clothes, the cars and the game show the guys find themselves on for no apparent reason outside of the need for a set piece. The main takeaway here is there was a lot of good work put into this film. The exclamation point is back in "You're in the Hot Tub Now! ", over a half-hour (31:11) of behind-the-scenes clips, 10 in all (with a play-all option) which focus on a variety of elements from the film, including Lisa Loeb's participation, Nick's dance fad, the film's wedding subplot. If you were to watch these pieces without watching the film, you'd wonder, how exactly they would all go together in a single film. Then, you could watch the film and continue to wonder. Four deleted scenes (4:55) offer an inventory of ideas between Corddry and Nanjiani, more "look like" with Corddry, Duke and Robinson (which is really quite funny), another scene with the Cincinnati box and a scene with Corddry, popcorn and The Lady the Tramp. More Kumail is always welcome, and the "looks like" stuff could go on just about forever, but the other stuff was smartly cut. Wrapping up the extras is the Xtreme-ly titled "Bloopers and General F%#! Ups by the Cast" (8:33) with your basic goofs. Oddly though, a large part of the time is taken up by parts of the "looks like" run in the previous extra. It's weird, because it's so unlike this film to pad out the laughs. Also included a code for an Ultraviolet stream/download and digital copy. 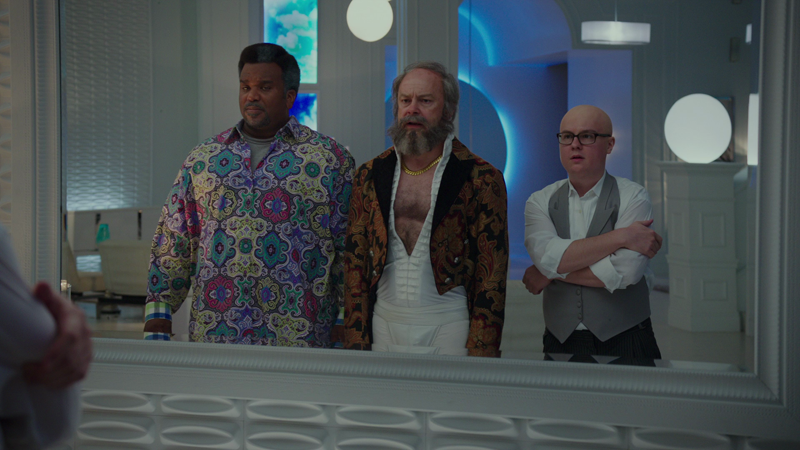 Following up on a much-enjoyed comedy that found its fanbase by being true to a goofy premise, Hot Tub TIme Machine 2 is just a disappointment due to the lack of focus and purpose, which puts to waste a fantastic comedy cast. The Blu-ray looks and sounds quite nice, and offers a decent amount of bonus content (though it suffers a bit from repetition.) Newcomers are better off sticking with the first film, while only diehard fans should bother owning this jumbled let-down.